The fans were screaming, the media running and the celebrities dancing -- yes, it was the 2011 International Indian Film Academy Awards that brought Bombay and Bollywood to the streets of Toronto for a decidedly spicy IIFA weekend full of film, fashion and masala-style fun. Keep reading to find out which stars came, which films won big and why the 12th annual IIFA awards weekend was a memorable Canadian affair. Confirming Bollywood celebrity appearances is about as easy as getting through Bombay's glutted traffic, so it's no surprise that there was a lot of confusion, debate and disappointment surrounding which stars would touch down in Toronto for IIFA 2011 (read more about it here). A smattering of sultry sirens came along with a handful of Bollywood hunks but by far the biggest star at IIFA 2011 was the king of Bollywood himself, Shah Rukh Khan. His attendance was confirmed mere days before the big event and the pandemonium that ensued was a testament to his astonishing global star status. Bollywood heavyweight Salman Khandropped out at the last minute to much disappointment, but young hero Ranveer Singh joined Anil Kapoor, Sonu Sood, Ritesh Deshmukh, Boman Irani and Rahul Khanna, who all shared the IIFA 2011 green carpets with Dia Mirza, Bipasha Basu, Mallika Sherawat and Shilpa Shetty. Mallika Sherawat, Boman Irani, Anil Kapoor, Sonu Nigam, Anupam Kher, Bipasha Basu, Dia Mirza, Ritesh Deshmukh close the first official IIFA 2011 press conference at the Fairmont RYH. IIFA is quite unlike other award shows for a number of reasons, including the fact that it's really about a whole weekend of celebration and cross-cultural exchange in terms of both entertainment and business. A highlight of the 2011 IIFA awards weekend was the IIFA Rocks fashion show on June 24, which brought Bollywood stars and Bombay models to the stage for an evening of performance and fashion. Though the stars weren't necessarily dressed to impress on the green carpet, the show itself had a few strong looks. Stylist to the stars Pernia Qureshi told me she didn't like much at IIFA Rocks, though Neha Dhupia's polka dot dress and co-host Anuksha Sharma's simple yet elegant gown both caught her eye (read my interview with her here.) She did have praise for the Sabyasachi show however, saying "the garments were fresh, well tailored and styled very well." Handsome actor Rahul Khanna lent his star power to the Rajesh Pratap Singh show, who also dressed him for the big awards show on June 25, in an outfit he told me was "a contemporary take on a traditional outfit; it was our nod to Nehru." Though IIFA Rocks was billed as a fashion show, Khanna articulated its more purposeful impact succinctly by saying, "The whole weekend was about bringing Indian talent to the world... I was proud to showcase such a gifted and uniquely Indian designer on an international platform." With an incredible 700 million people around the world estimated to have watched IIFA 2011 it's no surprise that each and every IIFA event had the power to affect great change in attitudes, appreciation and of course, much sought after star-making. Jermaine Jackson performs with Sonu Nigam at 2011 IIFA Rocks. The much-anticipated climax of any IIFA weekend is naturally the glitzy final awards show, which sold out in Toronto this year in a matter of minutes and filled the Roger's Centre to capacity with adoring fans. It started late, went on into the wee hours of the morning and thought the performances were energetic, the actual awards given out were unsurprisingly predictable. Hosts Ritesh Deshmukh and Boman Irani stayed afloat but have been far funnier in previous years, Bipasha Basu gyrated Bollywood style to hits like Munni Badnaam Hui and Sheila Ki Jawani, Shah Rukh Khan co-hosted and performed despite a much discussed bad knee and Priyanka Chopra paid tribute to legend Asha Bhosle, who received a Lifetime Achievement Award. The big winner of the night was Dabaang, a film starring a crooked but funny and ultimately endearing cop played by Salman Khan (see film stills here.) It won Best Film, Best Screenplay and had new lead actress Sonakshi Sinha and established villain Sonu Sood win in their respective categories. Shah Rukh Khan won Best Leading Actor for My Name is Khan, which also snagged awards for Best Director and Best Story, among others. Young Bollywood darling Anuksha Sharma won Best Leading Actress for Band Baaja Baraatand the film's hero Ranveer Singh won Best Debut (Male) for his performance. Throughout the night many other players in Bollywood's filmi firmament took to the stage to receive their awards, while many in the audience struggled to sit through the incredibly long show. Mallika Sherawat and Brian White at the press conference for their new film Politics of Love. As with any star-studded international show there are always critics finding fault with a production but some criticisms of IIFA 2011 seemed particularly pronounced. I asked Rahul Khanna to weigh in on the negative reaction and he was surprised to hear that there was one. He found hosts Ritesh Deshmukh, Boman Irani and Shah Rukh Khan very entertaining and said he enjoyed Shiamak Davar's staging but had the best things to say about the city's fans. "What will stay foremost in my memory is meeting all the fans everywhere we went in Toronto. They were so enthusiastic and warm," said Khanna, echoing many of the other Bollywood stars who voiced their gratitude for the outpouring of love and attention from the fans. 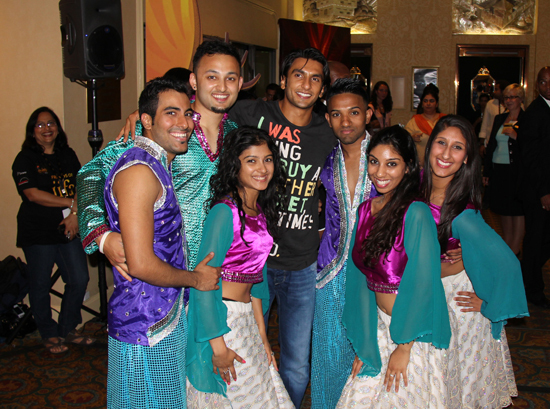 Ranveer Singh poses with Bollywood dancers upon arrival at the Fairmont RYH. The indulgent glamour, madness and all out hysteria that met IIFA 2011 in Toronto was swept away when the stars departed and has given way to excitement over William and Kate's royal visit to country but the beauty of Bollywood is that it tends to leave an indelible mark wherever it goes. While the media attention for IIFA 2011 was scant compared to the fuss and fanaticism displayed by fans, Canada will always be remembered for hosting the 12th annual IIFA Awards Weekend with panache. Where IIFA will go next year is anyone's guess -- though Rahul Khanna thinks Vegas, Monte Carlo and Sydney would be good fits -- but one thing is for sure, Bollywood will forever have a place in the hearts of all Canadians who like a little spice in their lives. Shah Rukh Khan at IIFA 2011. See dozens of more great photos of the stars at IIFA 2011 here.